With her first novels, Himself and The Hoarder, Jess Kidd established a distinctive and playful gothic tone that won over a host of Waterstones’ booksellers. There’s equal enjoyment to be found in her latest offering. 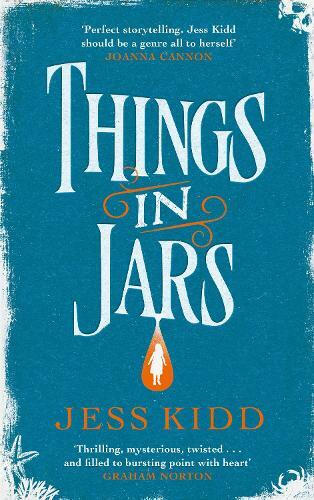 A Victorian mystery, generously laced with uncanny twists and sideways glances, Things in Jars follows pleasingly forthright, cross-dressing, pipe-smoking detective, Bridie Devine, on the trail of a stolen child. Moving at a lick and with surprises and vaudeville treats aplenty, it’s a treat. I must say that 2019 will be the year of gothic literature. I’ve read so many wonderful books since January and this one particularly stands out. Only Jess Kidd has gone and done it again. Don't hesitate for a second , read this book! I love this book! There, a review in four words. But I am compelled to say so much more. You can’t help gushing when a book comes out that you love can you? I miss Bridie already.